918 Bathurst Centre for Culture, Arts, Media and Education is an arts and culture sanctuary in Toronto’s Annex Neighbourhood. Our mandate is to support new and experimental arts by providing space to individuals and organizations that otherwise could not incubate, rehearse and present their work in the heart of downtown Toronto. We are always looking to partner with artists, organizations and collectives to produce theatre, dance, concerts, film festivals, art galas and exhibitions and many others types of arts and culture events. 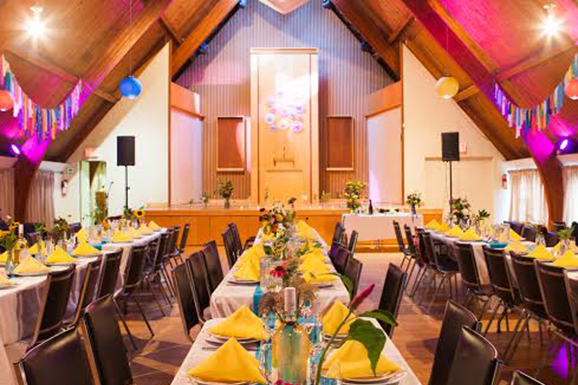 A former Buddhist temple, our multi-use facility is equipped with a 200-seat theatre and an visual art gallery which has been host to a wide array of arts and cultural organizations from Toronto and across Canada. 918 Bathurst is also the ideal venue for private events such as workshops, weddings, seminars, trade shows and more. As we are a non-profit, the proceeds from your event will be reinvested into the arts and culture at 918 Bathurst. 918 Bathurst is an Associate Member of the Bloor St. Culture Corridor, an organization that includes the Royal Ontario Museum, Royal Conservatory of Music, The Gardiner Museum, Alliance Francaise Toronto and 15 other prominent Toronto cultural organizations. These partnerships have allowed us to strengthen our connection to our local community as well as receive leadership from these institutional pillars of Canadian arts and culture. 918 Bathurst offers internships & volunteer opportunities, including student volunteer service hours toward fulfilling high school credits. We can help students fill out the “Notification of Planned Community Involvement Activities” form and find a suitable match of work, experience and personal interest. We offer a positive space that encourages both personal and professional development. You will have the opportunity to work with creative, professional, and amazing people! 918 Bathurst can help you with your Career Development: If you are interested in working with 918 Bathurst as a volunteer or intern, please send us an email introducing yourself. We would like to know who you are, how you heard about us, why you are interested and what you would like to do. Please attach a CV or resume with your email. 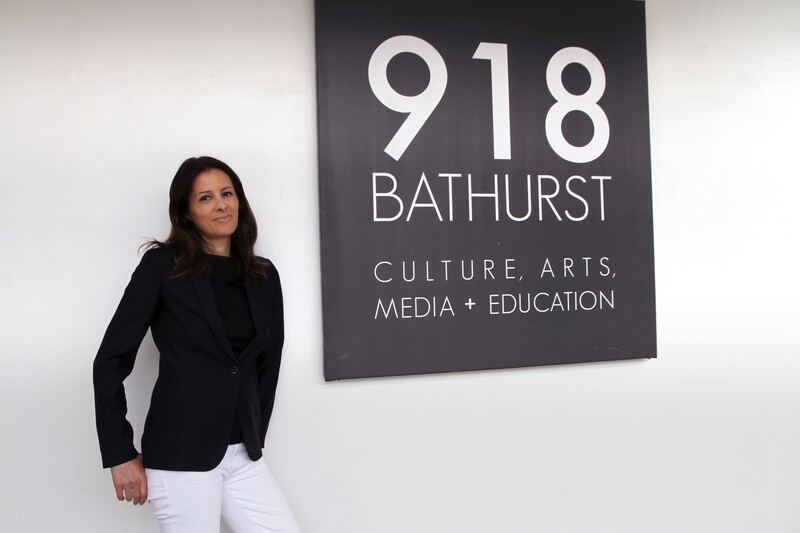 With over 20 years in the arts as an arts entrepreneur, presenter, award-winning musician and recording artist, Daniela brings a love, passion and wealth of experience for the arts and culture to the role of Executive and Artistic Director at 918 Bathurst. To say that culture and the arts are Daniela’s life is an understatement. Nurturing and expanding diverse cultural and multicultural milieus are her passions. 918 Bathurst is the perfect incubator. 918 is a vibrant member of Toronto’s cultural landscape. It is a space whose mandate is to foster and support new creators, thought leaders and arts visionaries. Locally, nationally and internationally, Daniela has spent a lifetime steeped in culture, with a special focus on Italian Canada. She is the Founder and Artistic Director of Salone di Cultura, a successful series of bilingual, multi-modal cultural exchanges between Canada, Italy and its sizable diasporas. She is the past Chair of the Culture Committee for Villa Charities. Daniela also served as the Cultural Director at Toronto’s Columbus Centre, where she developed the institution’s forward-looking Cultural Strategic Plan. Daniela has also garnered experience as a marketing and communications director/strategist and fundraiser in arts and non-arts environments. She is a graduate of York University’s Fine Arts program in Music, as well as Humber College Jazz programs. Daniela has served on the advisory board for Prism Music Video Prize, as a member of SOCAN, Toronto Musicians’ Union, ACTRA and Canadian Guild of Canadian Film/TV Composers. Daniela was born and raised in Toronto and lives in the centre of the city with her husband.